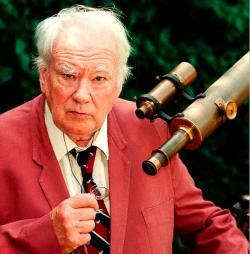 The overused title ‘national treasure’ for once really applied in the case of Sir Patrick Moore, the amateur astronomer, moon-mapper and populariser of science who has just died. In him were encapsulated several of our most cherished characteristics: he was eccentric, playing the xylophone, a cricketer until his seventies and sporting a monocle; a gentleman amateur whose work annoyed a few academics but inspired untold thousands of youngsters (and was used by NASA); all who knew him acknowledged the man as generous and fun-loving; and he was enormously enthusiastic, his machine-gun delivery much mimicked. Add to that his war heroism – joining the wartime RAF by lying about his age and bypassing the physical that he’d have failed – and the phrase rounded figure fits perfectly (especially as in later life he was decidedly rotund). We can even pardon him his rather un-PC pronouncements of more recent days, and given the loss of his fiancée to a Nazi bomb we understand his unwillingness to forgive the German nation. His presence on The Sky at Night – missing just one edition from May 1957 until his December 2012 death – was a little bulwark of British civilisation that will be hard, maybe impossible, to replace.